This dialog provides controls to specify the properties of a Harness Connector object. A Harness Connector object is an electrical drawing primitive that is essentially a container to group various signals together to form a Signal Harness including buses, wires, and other signal harnesses. A Harness Connector is defined by the Harness Type. 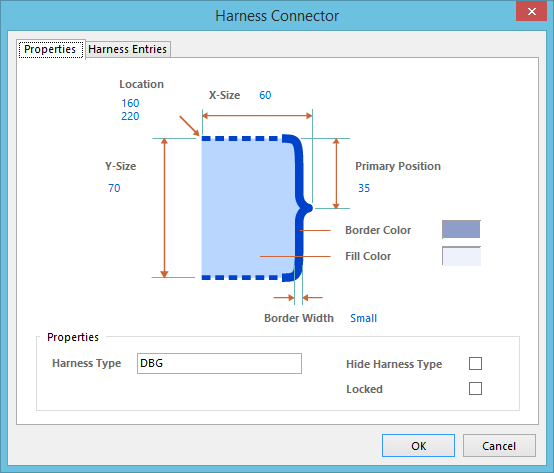 For information on how a placed harness connector object can be modified graphically directly in the workspace, see Graphical Editing. The Harness Connector dialog can be accessed during placement by pressing the Tab key. Double-click on the placed harness connector object. Place the cursor over the harness connector object, right-click then choose Properties from the context menu. Use the dialog's Properties tab to modify graphical properties of the harness connector object. Location - the current X (horizontal) and Y (vertical) coordinates for the top-left corner of the harness connector (X is the top value, Y is the bottom value). Edit these values to change the position of the harness connector in the horizontal and/or vertical planes respectively. X-Size - the current length of the harness connector in the horizontal plane. Y-Size - the current length of the harness connector in the vertical plane. Primary Position - the current position of the tip of the connector's curly brace in relation to the top of the connector. Increasing this value will move the tip further downward. Border Color - click the color sample to change the border color for the harness connector using the standard Choose Color dialog. Fill Color - click the color sample to change the fill color for the harness connector using the standard Choose Color dialog. Border Width - the width of the border used to draw the connector's curly brace. Available widths are: Smallest, Small, Medium, and Large. Harness Type - use this field to identify the harness connector. This name is used for connectivity purposes when building a signal harness system involving this connector. Hide Harness Type - enable this option to hide the Harness Type text string in the workspace. Locked - enable this option to protect the harness connector from being edited graphically. An object that has its Locked property enabled cannot be selected or graphically edited. Double-click on the locked object directly then disable the Locked property to graphically edit the object. Use the dialog's Harness Entries tab to manage the connector's associated harness entries. Entry - the name of the harness entry. Change the name as required by clicking on the field to focus. Harness Type - the Harness Type for the harness entry (where specified). This will typically be blank when a wire or bus is connected to the harness entry and is used only when another signal harness itself is connected. A Harness Type can be directly entered. Alternatively, the associated drop-down lists all currently defined Harness Types detected across the source schematic documents of the active project. When a harness entry is physically connected to another signal harness (facilitating nested signal harnesses), it will automatically inherit that harness's type. This type cannot be changed within the Harness Entries Grid. Remove - click this button to delete the selected harness entry(ies) from the list. Standard multi-select techniques are supported (Ctrl+click, Shift+click, click&drag). Add - click this button to add a new harness entry to the connector. The new entry will be added at the bottom of the list and be given the default name 0. The Harness Type entry will be left blank.